We here at Monotonik vehemently enjoy mixing up the brand-new idm goodness with some beeptastic sinewaviness from back in the day. And this sublime selection is the first in a series highlighting the littleknown Commodore Amiga chiptune format, AHX, which stands for ‘Abyss’ Highest Experience’, and was a gorgeous effort to resurrect C64-style synthetic tunes later in the Amiga’s life. So we thought – who would be the best people to pick the best ever AHX tunes? Why, we went straight to the source, Martin ‘Dexter’ Wodoks and Manfred ‘Pink’ Linzner, the original creators of the AHX tracker format as members of Abyss, and nowadays successful Nintendo GB/GBA developers, with games such as “Iridion” and music for titles like “Tony Hawk’s Pro Skater” with their company Shinen. What we got were 10 of the best AHX tunes ever tracked, as picked by Dexter+Pink, and showcasing musicians like smooth former C64-er D’aizl/Mystic, the dazzling Pink/Abyss himself, and the underground phenomenon Geir Tjelta, a Norwegian who’d been tracking synthetic tunes for almost 10 years by the time he got to these tracks, and whose _amazing_ outings on AHX have largely been ignored due to the obscurity of the format. So, whether it’s the heavenly “New Beginning” series or the epic “Countdown To Nil” by Geir Tjelta (who we tracked down and has officially approved of this compilation! ), or Pink’s spritely and stylish selections such as “Fame” and the supercatchy “Afternoon Voyage III”, you’re guaranteed a droolsome time in AHX-land. 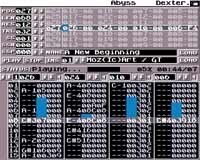 When it comes to downloading, we’ve provided mp3 versions of all of the tracks, but we had to guess at sensible points to fade out, since these tunes are all meant to loop for ever, like many older chiptunes.